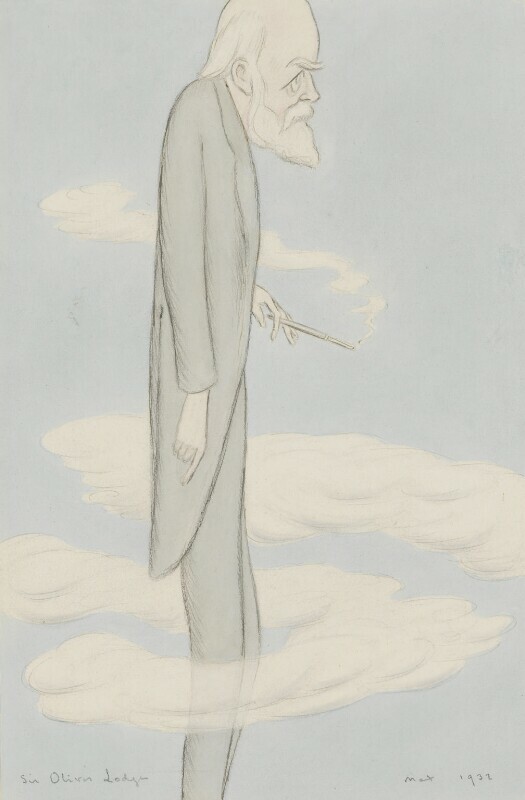 Sir Henry Maximilian ('Max') Beerbohm (1872-1956), Writer and caricaturist. Artist associated with 29 portraits, Sitter associated with 19 portraits. After the death of his son in 1915 he became interested in psychical research and considerably influenced its philosophy; the caricature may indicate his other-worldly preoccupations. Sir Oswald Mosley forms the British Union of Fascists. Mosley's party - nicknamed the Black Shirts after their uniform - was founded along the lines of Mussolini's Fascist Party in Italy and called for the replacement of parliamentary democracy with a system of elected executives. During the war Mosley was interned and the BUF was proscribed. John Cockcroft and Ernest Walton 'split the atom'. In fact, Cockcroft and Walton's achievement was to change the nucleus of one element into another by bombarding it with protons, rather than to literally spit an atom apart. Nevertheless 'splitting the atom' has become the popular way of describing this important stage in the development of nuclear technology. Saudi Arabia is formed by the unification of the Kingdoms of Hijaz and Nejd under King Abdul Aziz. Iraq is granted independence from the British mandate established by the League of Nations in 1919-20.